The multi-story, red brick building where the young woman lived could have been appealing in more pleasant surroundings, that is, some place other than the city that started going down hill decades ago and never recovered. When the concerned couple finally got inside her apartment, it was freezing and she was dead. But the two abusive men in her life – her boyfriend and estranged husband – both had airtight alibis. Each day, a new clue will be posted until someone names the location, providing the street address, city and state (or province/country if located outside the US) and an explanation as to how each clue applies to the location. If no one correctly names the location, the contest will end at midnight (Eastern time), Saturday, December 8, 2018. Please note, the contest ends at midnight in the Eastern Time Zone. If you live in a different time zone, please make adjustments so you will know what time it ends where you are. You may discuss the location with other members by posting your comments using the “reply” option, but please do not attempt to name the location until you are absolutely certain of your answer and able to post the street address, city, state, etc., along with a photo, or link to a photo, of the Location. For those of you who remember our old Mystery Locations contest, the point system has changed. Now, if you name the location on the first day, i.e., Sunday, before midnight (ET), you will receive 7 points. Thereafter, the points will depend on the number of clues that have been provided when you name the Location as indicated below. If you name the Location after the first clue, you will receive 6 points, etc., as indicated below. However, after the Sixth (last clue) is provided on Saturday, you must name the location before midnight (EST) Saturday night. If you wish, you may collaborate with another member and if the two of you win, points will be divided between the two of you. This contest is meant to be fun, so, as before, we ask that you conduct yourself accordingly. To prevent any accusations of favoritism, Kitty has been advised of the name and address of the Location and will not be participating in this week’s contest. I've seen the statue and know what and where it is, but it doesn't help me identify the mystery location. This is Place Ste. Marie, low-income housing apartments at 64 Oxford Street, Lewiston, Maine. On November 9, 2011, Jon and Joline Turner found their daughter, Samantha Folsom, 26, dead in Apartment S3E. They were worried because she was supposed to enter rehab for drug addiction earlier that week and they couldn’t locate her and had reported her missing. Someone had killed her and put her body in a closet. The apartment was freezing because the windows were open and the high temperature that day was below 32 degrees. She had become addicted to heroin while she and her husband, Jesse Folsom, were in California. 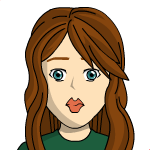 The two most likely suspects: Samantha’s boyfriend and estranged husband were immediately cleared because both were in jail. The boyfriend had been arrested for assaulting Samantha and Jesse Folsom had been arrested for assaulting the boyfriend. Neighbors saw a man they described as in his late 20s wearing an ID badge around his neck in the building around the time of the murder, but he was never identified. The murder has never been solved. Lewiston, with a population of around 36,000, is the second-largest city in Maine. At one time, a lot of people in Lewiston spoke French because a lot of French-Canadians immigrated to the area to work in the factories. Gov. Paul LePage, our current governor, was born in Lewiston and grew up speaking French. The Basilica of Saints Peter and Paul in Lewiston is the only basilica in Maine. Lewiston has been considered a dump for at least the past 50 years, but it still had little crime (like most of Maine) until Somali refugees began pouring into the area because of Maine’s liberal welfare system. The city is no longer safe for white people. Just last spring, a gang of Somalis attacked and killed a white man in Lewiston and there have been other gang attacks. So my advice to anyone planning to move to or visit Maine is to steer clear of Lewiston. 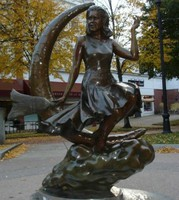 The statue in Lappin Park at 235 Essex Street in Salem shows Elizabeth Montgomery on broomstick. She played the part of Samantha Stephens in the TV show Bewitched. Congratulations, Julia. You must be really good at solving puzzles. Thank you for your congratulations.